The Illinois Democrat said Trump's accusation was "just the latest in a string of recent comments where he accuses Democrats like me of not caring about our military"
Sen. Tammy Duckworth, of Illinois, responded to President Donald Trump's accusation that Democrats are "holding our military hostage" in a fiery speech on the Senate floor Saturday. 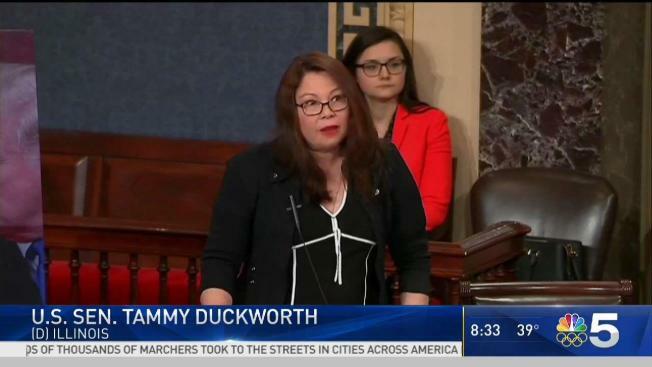 Sen. Tammy Duckworth slammed President Donald Trump over the federal government shutdown on Saturday, calling him a "five-deferment draft dodger" in a fiery speech on the U.S. Senate floor. Duckworth, an Iraq war veteran who lost both legs when the helicopter she was co-piloting was hit by a grenade in 2004, was specifically responding to a tweet in which Trump said "Democrats are holding our military hostage" in the shutdown. The Illinois Democrat said Trump's accusation was "just the latest in a string of recent comments where he accuses Democrats like me of not caring about our military." "I spent my entire adult life looking out for the well-being, the training, the equipping of the troops for whom I was responsible," she said, adding, "Sadly, this is something the current occupant of the Oval Office does not seem to care to do. And I will not be lectured about what our military needs by a five-deferment draft dodger." Duckworth was referring to the deferments from the military draft Trump received – four as a college student and one medical deferment that Trump told the New York Times was for bone spurs in his heels. "And I have a message for Cadet Bone Spurs: if you cared about our military, you’d stop baiting Kim Jong Un into a war that could put 85,000 American troops – and millions of innocent civilians – in danger," she continued. Duckworth's speech came hours after the federal government shut down, halting all "non-essential" operations at midnight Friday after last-minute negotiations on a spending plan failed. Trump and Congressional Republicans blamed Senate Democrats, who filibustered the short-term funding bill that cleared the House the night before in hopes of putting pressure on negotiations surrounding an immigration deal. 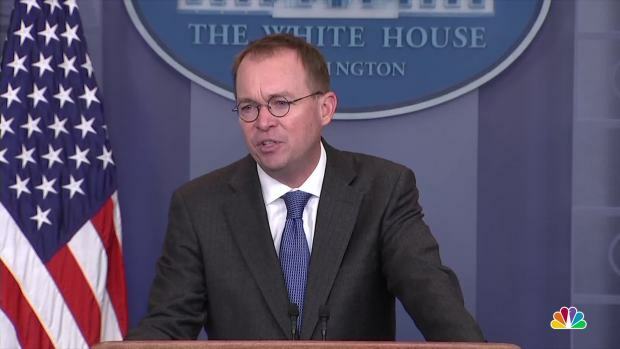 At issue is the legal status of so-called "Dreamers," the nearly 700,000 undocumented immigrants who entered the country as minors and were protected from deportation under the 2012 Deferred Action for Childhood Arrivals policy that the Trump administration ended in September. "Democrats are far more concerned with Illegal Immigrants than they are with our great Military or Safety at our dangerous Southern Border," Trump tweeted Saturday morning. "They could have easily made a deal but decided to play Shutdown politics instead." Democrats, joined by a handful of GOP senators in voting against the stopgap measure, blamed Republicans, who control both chambers of Congress and the White House, for not accepting a bipartisan compromise. Democratic lawmakers said Trump hurt negotiations by initially expressing support for the deal before abruptly walking away. "Our troops know how to work together," Duckworth ended her speech Saturday. "They stand shoulder to shoulder to protect and defend this country. We surely in these chambers can do the same. So let’s stop blaming each and other and let’s get to work."